Slay all day and night in a pair of fierce AF pink heels from In The Style. Browse the collection to discover slayin' styles for any occasion. From eye-popping hot pink shades to on-trend corals and dusty hues, we've got everything you're looking for and more. 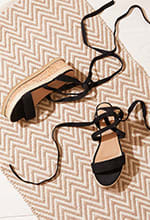 Update your shoe-drobe with strappy sandals and barely-there styles! Make a big impression on your next night out, by accessorising your go-to little black dress, with a pair of coral heels and a matching clutch. Or if you're keeping it casual, then team your blue mom jeans with dusty pink suede and an off-duty bodysuit. Start scrollin' babe!